Hotel des Facultés is located in central Lyon, 400 metres from the Jean Macé Metro Station and a 10-minute walk from Place Bellecour. It offers rooms with free Wi-Fi access. Guest rooms are equipped with heating and a TV, and some rooms have a private bathroom. 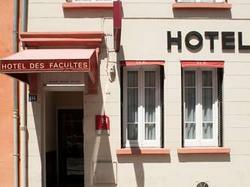 Hotel des Facultés serves a daily buffet breakfast and also provides a bike rental service. Facultés hotel is 1.5km from the Lyon-Perrache TGV Train Station. The Rue de l'Université tram stop is just 300 metres from the hotel and Lyon Saint-Exupery Airport is 20km away. The reception is open from 08:00 to 19:15 Monday to Saturday. The reception is open from 08:00 to 13:00 on Sundays. If you plan to arrive outside of reception opening hours, you must contact the hotel in advance in order to obtain an access code. With shared bathroom and toilet, this room features a flat-screen TV and Wi-Fi access. Toiletries are provided. With private bathroom and toiletries, this room features a flat-screen TV and Wi-Fi access. A work desk is also available. This room features a flat-screen TV and WiFi access. Toiletries are provided. There is access to shared toilets and showers.